The two pictures attached to this article were provided to my husband when he picked up a prescription this week. They are the Pharmacy’s questionnaire for people wishing to get a flu shot and the “informed consent” that they must sign in order to be inoculated. Now my husband wasn’t there for a flu shot so it is interesting that they just happen to be giving out this paperwork. Do you think this is a public service? I took it as more of a flyer, letting people know who’ve been advised to get the flu shot that they can get it “free” at the pharmacy, a little chore they can get done while they’re getting their prescription or picking up shampoo. In fact, having heard how convenient it is to do this at the pharmacy, many people may actually decide to get their flu shot there. I am pretty cynical about the motivation of pharmacists to provide this service and so I see these documents as “flyers” advertising a “loss leader”. Contrast this with the experience should the patient happen to have visited their family doctor for the flu shot, which I did. 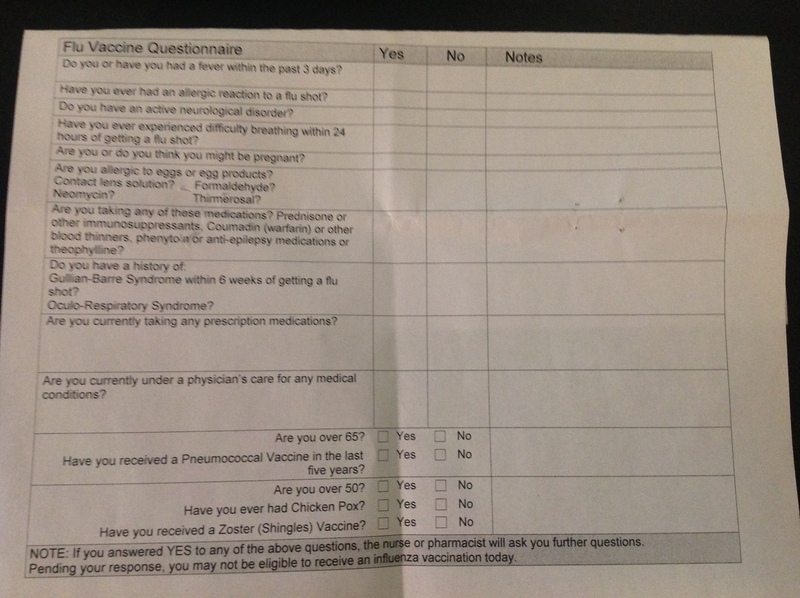 My family doctor asked me many of the questions on the “Flu Vaccine Questionnaire” and outlined some of the new aspects of this year’s vaccine, but he took the fact that I was there seeking this service as my informed consent and certainly didn’t ask me to sign a waiver. I don’t think it’s an error on his part. I believe that this reflects that he provides and coordinates all of my health care. When I signed up for his practice, that was our agreement that he would direct my primary care and I would get my care from him. I believe that what my family doctor does is very similar to what every family doctor does. The pharmacist is clearly required to complete – or have you complete – a number of documents. Pharmacists don’t keep a detailed medical record such as your family doctor is required to keep that already outlines all of the medical history contained in the questionnaire. Your family doctor will also have details of any past blood work, your most recent physical and likely more medical information about you than you ever dreamed there could be. More importantly, your family doctor will understand what all of this information means to a degree that your pharmacist does not. That is the benefit of a medical education, an understanding of health and disease in all its complexities. That is why whenever a pharmacist (or any allied health professional) wants to begin to perform “simple” medical acts to save the system money and resources, I become suspicious. A pharmacy is a big business. I do not believe that there are very many, if any, pharmacies left in my community that are not franchised. I felt more comfortable when the pharmacist was the owner and “operator” of a pharmacy. I have no difficulty with businesses working to make a profit – I think they ought to make a profit – but I don’t like false advertising. I don’t think that the main reason pharmacies provide vaccinations is to provide a service. I think the convenience is a “loss leader” for more profitable enterprises. I’d prefer that the focus of the person providing my flu shot was my health care. That’s what patient-centred means to me. An independent owner run pharmacy in Ottawa is Watson’s Pharmacy with 2 shops. One on Main Street and one in Westboro. Hi Ann, Thank you for this reminder and tip. My family and I are trying to move all of our prescriptions to this pharmacy. Many readers take this essay as a criticism against pharmacists but my concern is about the big pharmacy businesses. The small business pharmacist-owned pharmacy is a better care model, I think. 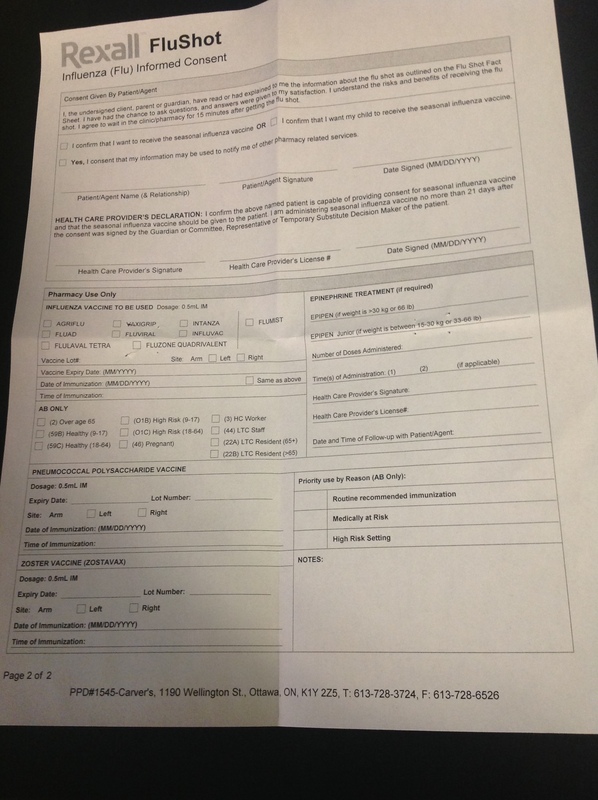 I liked seeing the forms used but they seem a bit like CYA instead of real informed consent. The proper screening questions are there but not word of any reactions or difficulties the vaccine may cause or what to do in the case of a problem. Ah, it did sound a bit like pharmacy bashing rather than big business well deserved criticism. I love that I can walk into a pharmacy and have a flu shot at my convenience. Making a doctors appointment in NB is a time consuming undertaking. When you finally get an appointment it is a two hour wait in the wIting room. Doctors are very busy and it is difficult to get a timely appointment. If we can take some of the load off them by having pharmacists, nurse practitioners or EMT’s do some of these procedures we would all benefit.